Stems: Erect to ascending, single, spreading from base, much-branched, with simple and star-shaped hairs. Leaves: Alternate, stalked, ovate or circular in outline, .5 to 3 inches long, .5 to 2.5 inches wide, palmately divided into 3-7 segments; segments lanceolate, oblong, or wedge-shaped, toothed or lobed, surfaces with scattered simple and star-shaped hairs; middle segment largest; margins saw-toothed or scalloped. Inflorescences: 1-3-flowered, terminal, on short stalks in axils of upper leaves; bracts 10-15, linear; margins fringed with hairs. Flowers: 1 to 2.5 inches across; calyces 5-sided, inflated, membranous, conspicuously dark-nerved, stiff-hairy; corollas 5-petaled, whitish to cream with dark purplish centers; veins dark; margins sometimes dark purple; stamens numerous, reddish, filaments united in column, anthers yellow. Fruits: Capsules, spherical to egg-shaped, 5-celled, hairy, enclosed in inflated calyces; seeds many, tiny, rough, grayish brown to blackish. Habitat: Disturbed sites, waste ground, cultivated fields, pastures, and roadsides. Distribution: Throughout, more frequently eastward in Kansas. Origin: Escaped ornamental that was introduced from southern Europe. Comments: Called "flower-of-an-hour" because of the brief time each flower remains open in the morning. 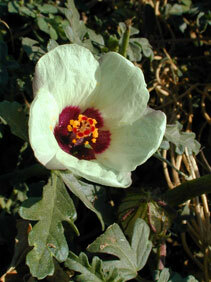 Venice mallow can be a problem weed. The seeds can remain viable in the soil for years.